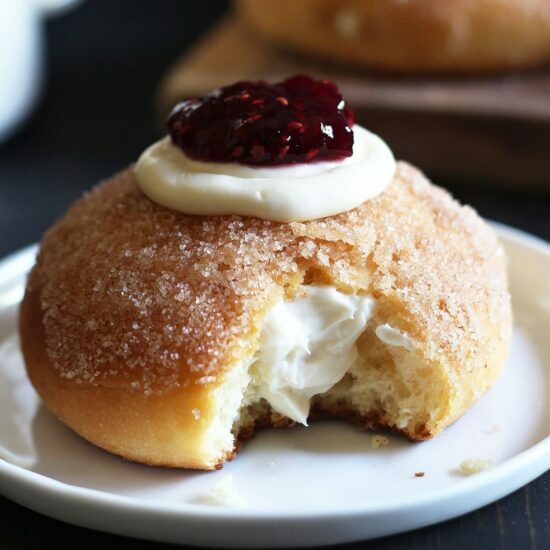 Cheesecake Stuffed Baked Doughnuts feature a fluffy yeast-raised baked doughnut coated in cinnamon sugar, stuffed with sweetened cream cheese, and topped with a dollop of raspberry jam. Taste: Like a classic cheesecake, but with a touch of cinnamon and in doughnut form! Mmm mmm. 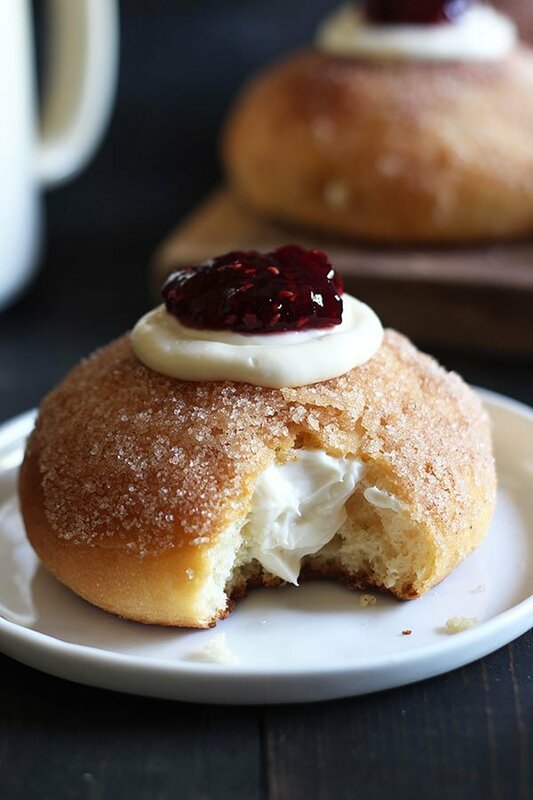 Texture: The doughnut is super light, fluffy, and tender while the cream cheese filling is thick, rich, and creamy. Ease: Easier than frying, but still requires a bit of patience since we’re working with a yeast raised doughnut. Pros: Better than most doughnuts at the bakery counter. Cons: Makes a bit of a mess. Would I make this again? Oh yeah, though I might add some Nutella to the cream cheese next time! Confession time. Sometimes I hate getting text messages. Which probably seems weird coming from a millennial who has had a cell phone within arm’s reach since age 14. But back then, you could only send like 50 texts a month and you had to type everything out on a number keypad. The texts you sent had to MATTER. Now the texts we get are nonstop and endless. I feel like I constantly have 10 (often meaningless) conversations going at any given time and it makes it difficult to focus or be in the moment. When I’m in the zone and have forgotten to silence my phone, getting a text message feels like a huge invasion. Does anyone else feel this way? Like… I didn’t invite you to have a conversation with me while I’m in the middle of finding out if Jon Snow is alive or dead on Game of Thrones! But of course, the sender has no idea what you’re doing. It’s all just very weird. But without that kind of technology you might not be reading this post for Cheesecake Stuffed Baked Doughnuts on your phone right now! Whenever possible, I like to include extra tips, tricks, and advice to help you along in the kitchen. I know there’s nothing more frustrating than having a question or getting stuck and not being able to get instant help. So, hopefully these tips answer any questions that might come up! Even though these are baked doughnuts, there’s no batter involved. Instead, to make these as close to traditional fried doughnuts in taste, texture, and appearance as possible, we’re using a yeast-raised dough. It’s a super rich dough with egg yolks, sugar, butter, AND cream in order to mimic the rich, soft, and fluffy goodness of fried doughnuts. I use instant yeast in this recipe because it’s so simple and easy and doesn’t need to be proofed. 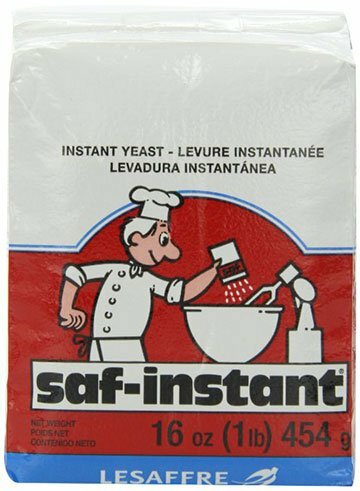 If you don’t have instant yeast, feel free to use the same amount of active dry yeast. Simple add it to the warm water and let it proof for 5 minutes before proceeding with the recipe. Enriched doughs like this one may take longer to knead and rise, FYI. This dough is pretty sticky which helps the final doughnuts maintain and fluffy and light texture. 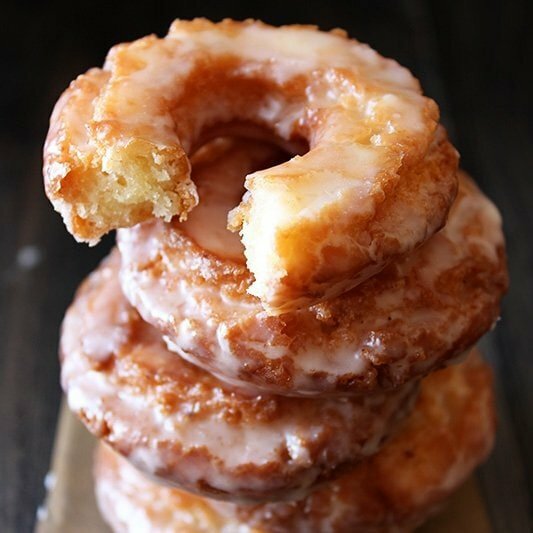 Avoid adding too much extra flour or your doughnuts may become dense and heavy. Also, since these doughnuts don’t have holes, you don’t need to worry about using a doughnut cutter or making one from two cookie cutters. One round cookie cutter does the trick here! Just a few ingredients makes up the cream cheese filling in this recipe. 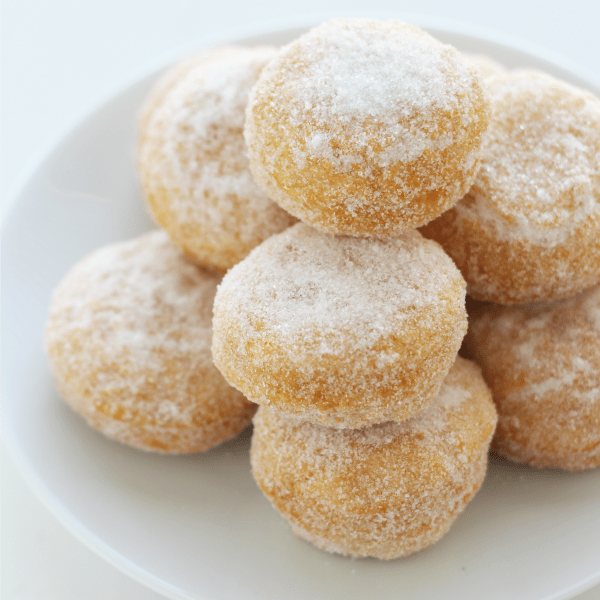 Feel free to add additional powdered sugar for a sweeter taste, if you prefer. I also like to top these doughnuts off with raspberry jam to give them a beautiful appearance and add a fruity fresh flavor. You can swap out raspberry for your favorite jam, or omit this step altogether. In the bowl of a stand mixer fitted with the dough hook, combine the water, zest, vanilla, yeast, eggs, and sugar. Gradually add in the flour then salt, mixing until absorbed. Add the butter and cream and beat on medium speed for 6 to 8 minutes, or until a smooth sticky dough forms. Remove the dough to a lightly greased bowl, cover, and let rise until doubled in size, about 1 to 1 1/2 hours. In a medium bowl using an electric mixer, beat the cream cheese, cream, sugar, and vanilla until light and fluffy. On a lightly floured work surface, roll the dough out to about 1/2-inch thickness. Using a round cookie cutter, cut out 6 rounds from the dough. Place on a large parchment-lined baking sheet spacing far apart. Cover and let rise until puffy, about 30 minutes. Meanwhile, preheat the oven to 350°F. Bake the doughnuts for about 10 minutes, or until golden brown and puffed. Let cool enough to be handled. In a shallow dish combine the cinnamon and sugar for the topping. Dip each warm doughnut in the melted butter, the coat in the cinnamon sugar. Remove the cream cheese mixture to a piping bag fitted with a long filling tip. 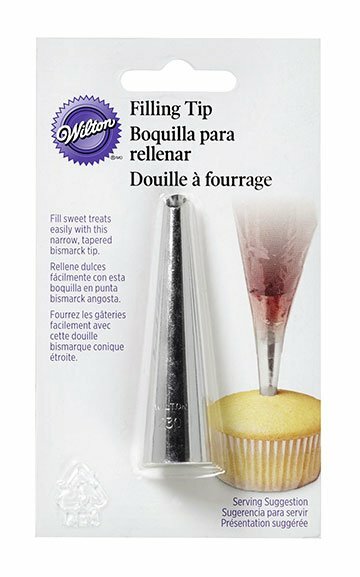 Insert the tip into the side of a doughnut and squeeze the filling inside to fill. Repeat for the remaining doughnuts. 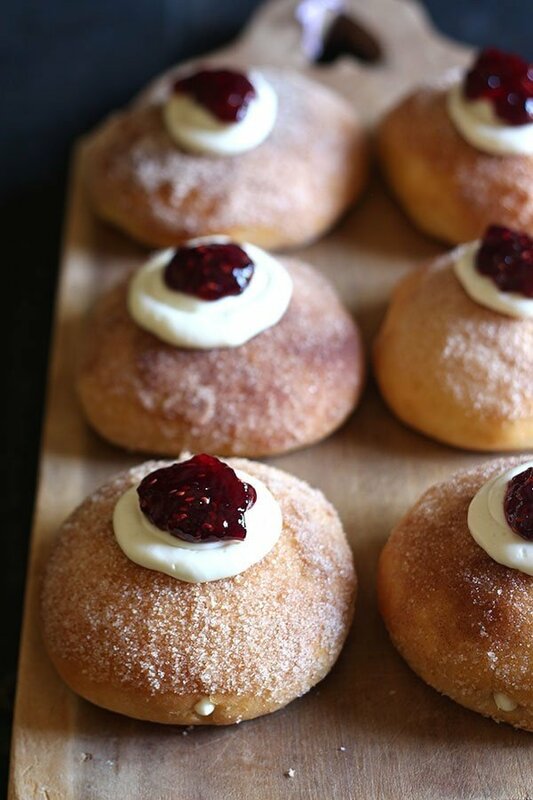 Top each doughnut with a dollop of the cream cheese mixture then drizzle with jam. Doughnuts are best served the day they’re made. Yes! Though I feel like I rarely get unsolicited phone calls anymore. When I saw these in the email last week, I just knew I had to make them for our group on Friday. So I did. I made the dough the night before and it rose enormously in the fridge. 2. They didn’t like the abrupt temperature chance from oven to kitchen. They sunk immediately when coming out, but luckily could still be filled. The taste reminded me of something my granny always made for us- “Dampfnudeln”, which is also rich yeasted dough, but fried and steamed in a pan and served with lots of Vanilla sauce. I plan to make these in high altitude. Baking is always a challenge…any tips? Maybe I should add some extra flour or cornstarch to the dough? Can’t wait to try these. I absolutely love these doughnuts and can’t wait to try them, but can you please give me a good replacement for egg yolks? These look really really yummy. Could you use a lemon curd as a filling also in these. These look absolutely gorgeous. Would they still be as fresh to eat the next day? Sometimes I feel like your replies come across as snarky. Such as asking the commenter if they read the recipe abs following up by quoting it. I get that sometimes people not reading it entirely is frustrating, but you run a blog, you should be used to this. Can I omit the lemon zest? In your directions you say to let the donuts cool completely. Then immediately after that you say to dip the “warm donuts” in the cinnamon sugar. what size circle cutter do you use? These are what the baby inside me has been dreaming about all during the 1st trimester! Now that the nausea has passed I can make them for V-day!! Do you think I could sub coconut milk for the heavy cream? Haha! Yay, glad you’re feeling better now! I’ve never tried with coconut milk so I’m not sure. If you did try that out, let us know how it went! How much yeast if your doing it from the jar? And how would you make the dough if your using the jar yeast? The same way it says in the recipe but after the yeast sits for a few? And can I use lemon juice instead? I did use coconut milk in the filling and it worked out fine. Honestly didn’t change flavor. Wow!! Just made these. I have made fried doughnuts before and in comparison, these are amazing!!! I always thought the fried were good but these make my other recipe seem awful! Think I’ll be playing around with fillings and toppings! Thanks! Is there a way to make the dough in advance and have it retard in the fridge and then go back to it? what if i dont have dough hook? can i just using my hand ? I have had this recipe saved for months waiting for when I would have time to make these and today was the lucky day. It wasn’t as difficult as I expected and they are definitely yummy! 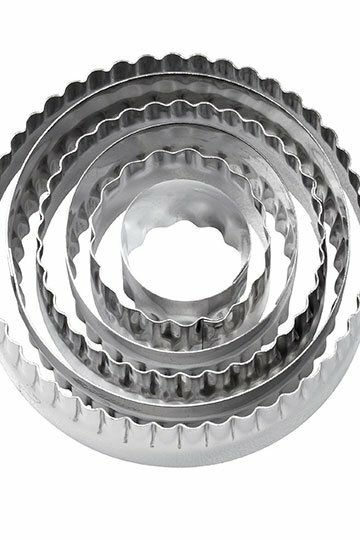 Just curious what size cookie cutter you used? I had tons of dough leftover. Wonderful, Krista! So happy to hear it. I believe I used about a 4 inch cookie cutter, but if you ever have leftover dough you can always make more!! Can they be deep fried in a fry daddy? Would love to do this while fall camping..
I’m not sure, Billie. I’ve never used a fry daddy. But I can tell you this recipe was specifically developed to be baked. I have a few fried recipes in my archives that might work for you! 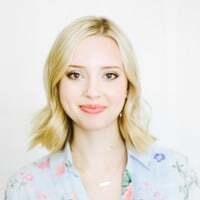 Thank you, Tessa for all your wonderful recipes. I made these doughnuts recently and they were a hit! I am making them again for an event this weekend. I appreciate your your philosophy about sweets!! Hi Tessa. I was wondering if the dough could be made in a bread machine. I don’t own a bread machine, but I don’t see why not! This looks absolutely amazing. I think I’ll be making these next weekend for breakfast. Can this dough be made in a bread machine????? I have to admit… doughnuts are my weakness – but not so much the fried stuff. That’s why I’m always looking for a good Baked Doughnut Recipe and this one is a Winner! 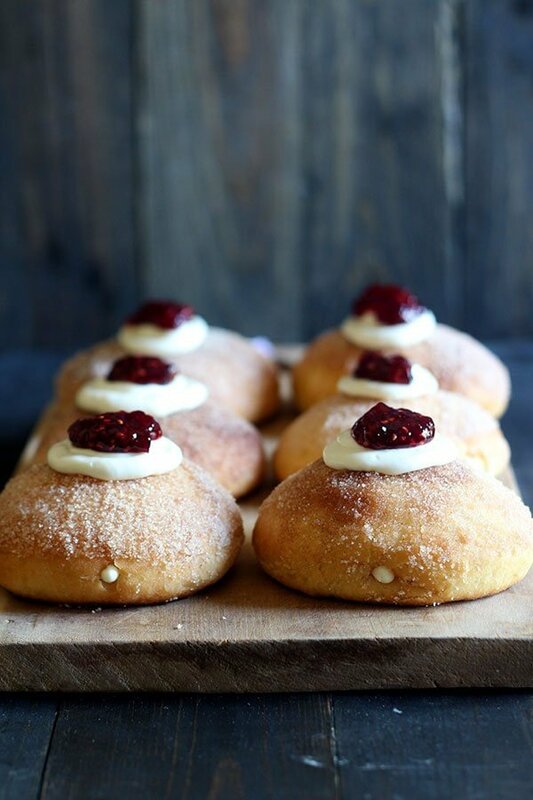 Would love to see you make this recipe into Boston Cream Doughnuts!…? Hi, recipe looks tempting. What can I substitute eggyolks with? When letting dough rise in fridge overnight, do you let it warm up before rolling out or can you work with it straight from fridge. Mine could rise a bit more. By the way made these last week… They are a hit! Thanks. can i substitute heavy cream in the dough with fresh milk? if so, what is the measurement? Hi I’m looking to bake these this weekend but need to make many more than 6, could I triple the recipe and would each stage take the same amount of time i.e. rising, or would I have to make three separate batches? Thanks in advance!